Erin K. Leonard has been a practicing psychotherapist for 15 years. She is the author of two books: Adolescents with HIV: Attachment, Depression, and Adherence in Adolescents with HIV (2008) and Emotional Terrorism: Breaking the Chains of a Toxic Relationship (2014). She has appeared on WGN and FOX affiliates in Dallas, Boston, Memphis, Atlanta, and Phoenix. She contributed a series of articles on depression and anxiety to magazines, including most recently to Health magazine. 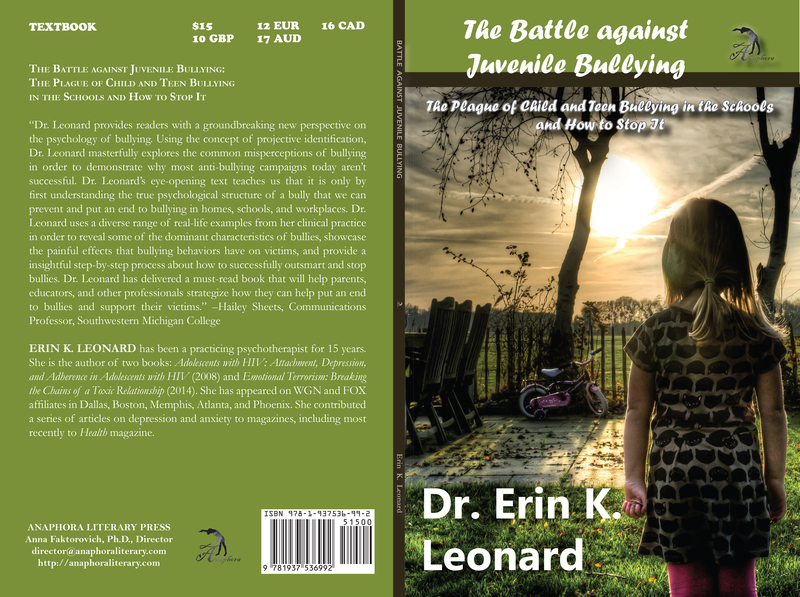 December 11, 2014, Thursday, 6:45am and 5pm: Interview about the book with Dr. Erin Leonard will broadcast on NBC WNDU 16: South Bend, IN: http://www.wndu.com/news. January 1, 2015, 9:50am: Erin Leonard had a 7-minute segment on “5 people to avoid in 2015” on WGN on New Year morning, and her Anaphora book was mentioned and shown at the end: http://wgntv.com/2015/01/01/5-people-to-avoid-in-2015.